You have written a proposal that has been approved, possibly revised a few times, and now you have been given the green light to get going and do the doctorate. This is an exciting moment in a doctoral candidate’s life, and one that brings both relief and feelings of ‘uh oh, now what?’ with it. What now, indeed? Once the proposal is approved, what next? What to write, or read, first, second and so on? Do you forget the proposal exists and start your thesis, or have you, in fact, already started it? My proposal was a fairly lengthy 20 pages, which is pretty standard in the social sciences and humanities, certainly in South Africa (as far as I can make out). It contains within it all of the parts that would need to be in the final thesis – literature review, methodology, theoryology, details about the data and the proposed analysis of it, and of course, the research questions and objectives. I was told by one of the supervisors in our programme, in my first year of the PhD while I was working on my proposal, that about 1/4 of your thinking needs to be apparent in the proposal. In other words, the proposal is not separate from the thesis – it is a fairly significant first step towards the thesis that indicates your ability to do research at this level, and your ability to complete this one viable, valuable research project. After my proposal was approved I felt, simultaneously, elated and freaked out. The proposal was a difficult genre to write, and I felt a bit at sea, not really sure what I was supposed to be doing, exactly. It can be argued that it is not terribly difficult to show your proposal readers what you have read thus far, where the gaps are and what your research questions therefore are. It is not even terribly difficult to explain, quite abstractly, the theory that will help you to answer these questions. But the methodology? The data and how you will build a ‘translation device’ or analytical framework to interpret the data and answer those research questions? Yikes. I really had no idea what I was doing in this part of the proposal. I mean, I could tell you it would be case studies, and qualitative data generation and analysis, and I could tell you I would generate data from documents, participant interviews and observations of teaching. But as to how I would organise all of that, or analyse it, I was pretty clueless. That was over a year away! I had no idea what I would even find, and while I had a grip on the theory, it was a fairly shaky one, and I was still making sense of how the theory, data and method pieces would fit together. The struggles in writing significant parts of the proposal meant that coming out of that phase of the doctorate into actually beginning the thesis, and doing the actual research, was quite stressful, and I felt quite lost, initially. I started with more reading, but the more I read, the more I confused myself (at least initially), and I kept losing my research questions and my basic plot, which was alarming. I thought, for a while, that all this meant I was a fraud, and that the committee at my university had approved my research plans in error. It took me a while to realise that I was mainly freaking myself out because I had forgotten the comment from one of the supervisors in our group: that about 25-30% of your thinking is within your proposal, which is your blueprint for the doctorate. I had already started my PhD – I wasn’t just starting now. Along with this realisation, which was comforting, what helped me past this was my own supervisor’s advice to begin the writing of the thesis by copying and pasting a chunk from my proposal – from the theory or literature review – into a new file and to start writing around it, modifying, adapting and obviously adding and extending it. This advice helped me to physically see that I had made a start on the writing, and I had a basis to build on. Very few of the actual words from my proposal are in the final version of my thesis – much of my thinking and expression of that thinking changed over the course of doing the research – but the parts of the proposal I copied into new files gave me ‘holding texts’ to work with towards creating chapter the first, and then the second, before I was up and running and could leave the proposal behind. While a PhD or MA proposal is often seen as a hurdle to be vaulted in progressing from candidate to graduate, and while some supervisors may even advise their students to leave the proposal behind so as not to be limited by it, I think it might be helpful to see a proposal as some of the supervisors on my doctoral programme do: as a significant, although early, step towards the PhD thesis, and as more than just a ‘test’ to be passed. 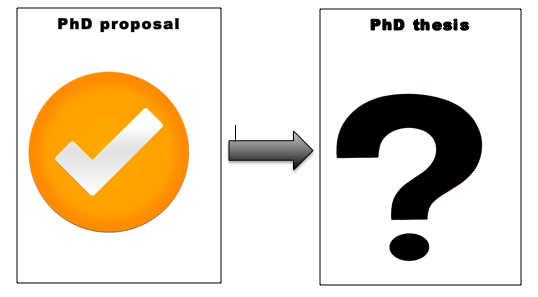 The proposal, ideally, should be your PhD’s holding text – not the final thing, of course, but a document that gives readers a fairly clear idea of what the final thesis could or may well be. As with all blueprints, there is and must be room for change, modification, improvement – but the research you actually do and write about shouldn’t be wildly different from the research you proposed to do. A good place to start your thesis, therefore, is your proposal: your thinking – at least part of it – is already in there, and proposal approval indicates that it is solid and useful thinking thus far. So, begin with what you have already written and write and think from that base, building upwards and outwards as you modify, adapt and hone your research going forward.